An expensive package arrived at my doorstep last week. You know what that means? Another Japanese import review, yay! 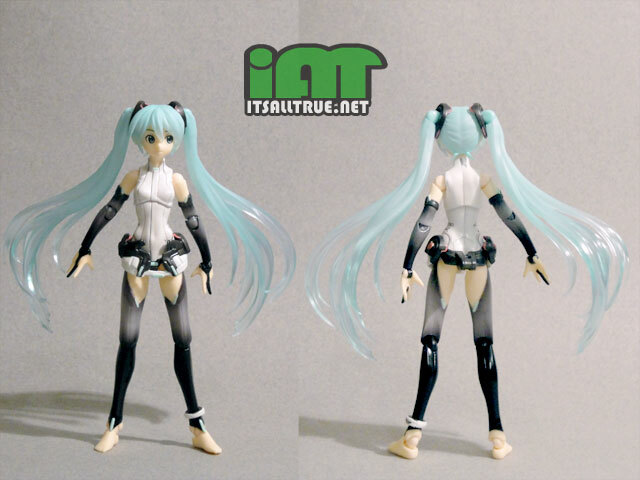 This time I’m taking a looking at Figma’s one hundredth figure, Hatsune Miku’s Append version. To celebrate the special occasion, Max Factory even included a bonus accessory. The character of Hatsune Miku was originally created as the mascot for the Vocaloid voice synthesizer program. Her mechanized voice was formed from the altered and synthesized voice of actress Saki Fujita, while her appearance was designed by manga artist Kei Garō. She was given a basic biography of essential information like her birthday, age, height/weight, and a simple back story explaining that she was “An android diva in the near-future world where songs are lost.” But beyond that she’s a blank slate, allowing the viewer or listener to impart onto her their ideas of what her personality is like. The most interesting thing to me about Miku is that she’s not just a singer anymore, but also a model, spokesperson, and all-around virtual idol. Even her lack of a tangible form hasn’t stopped her from appearing with the other Vocaloid characters live in concert with the help of some very advance projection technology. Her devoted fans treat her like a real person, making her one of the most prominent examples of how the lines between the real world and virtual reality continue to blur. 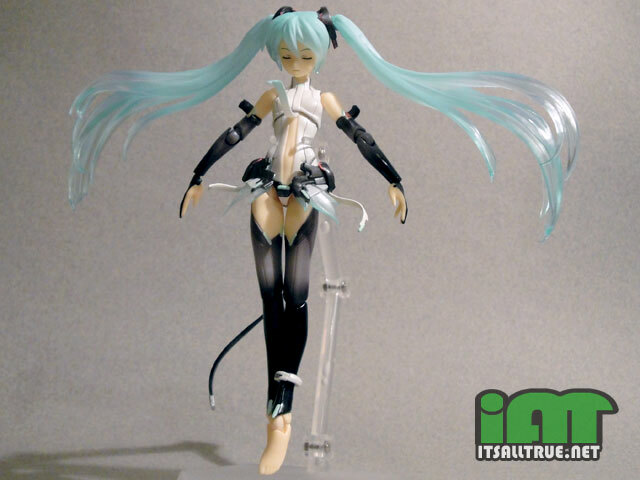 Miku was included as figure #14 in Max Factory’s Figma line way back in 2008. That’s way before I discovered the joy that is Japanese toy market. She had been long sold out, and her second hand value had gone up considerably. 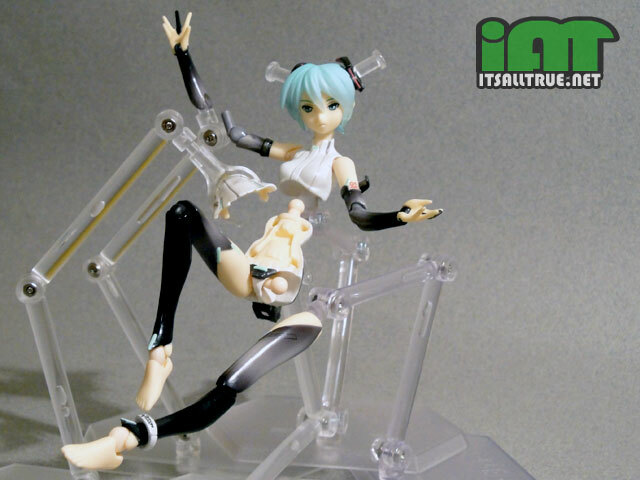 So I was happy to learn that Figma would be celebrating their 100th figure by releasing another Miku in the style of her Append extension program. Finally I could add her to my robot girl collection. Miku’s Append program was designed to add six new voicebanks which would bring more mood and emotion to the voice of her Vocaloid software. Likewise, her look was also evolved for the add-on. Gone was her cute schoolgirl-like appearance, replaced by a much more provocative and ethereal design. Figma did a fantastic job of reproducing this new look in plastic. Her sleeves and stockings are smooth, yet have inlaid lines like a Gundam model. The simple sculpt of her leotard is offset by the much more detailed buckle and speaker design of her skirt piece. But her most striking feature has to be her long and fluid hair. The frosted teal paint fades into translucent strands, giving the impression that it’s flowing into nothingness. I think that last picture on the first page killed me. I watched all the Saw movies while eating spaghetti, but that picture is so disturbing, I am now dead. On a scale of one to ten, six being the highest, I would rate this death as a four. Sorry Bray, didn’t mean to kill you. I was going for that assembly line look. where’d you get the figma sized couch? that’s fresh. like bray, that first page, final photo kind of bugged me, but i thought the fig had fallen apart on you… good to see that’s not the case. i think the ponytail joints are hilarious. in a cool way, they just add so much personality to her posing options. the blue katana is a nice touch too. The couch is from a dollhouse accessory set I picked up at Hobby Lobby. It also came with a chair in the same style. I’ve been trying to find more furniture for my figures to lounge around on, and these do really well I think. The katana is from the DC Direct Azreal. ah, i noticed it wasn’t in the list of accessories. I got my Miku in the mail last week and she’s quickly become one of my favorite display pieces. I did a little review of my own with some nice pics over on RangerBoard. I’ll be honest with you guys–the main selling points for this girl was that she’s well articulated and barefoot. It’s a rare combination, believe it or not. Thanks. I love to read toy reviews, so whenever I get a new figure and post pictures of it on RangerBoard, I write a little mini-review to go along with it. I like the racing figure best, but this one’s hair is awesome. Also, I totally agree that the last pic on the previous page is creepy. Very well done, though. I’ll have Manekochan make one. She’s good with the rulers and the pencils and the such. Another fantastic review. Golly, I love this site! I’m going to look for that couch! And the hair shows what’s possible for a Marvel Legends MEDUSA! Check out the Hobby Lobby website before you do. They usually put up a 40% off coupon at least once a month. first up i recently found out about vocaloids and have fallen in love with miku. gotta ask though what’s with the tail? it just kind of throws me as she has no other animalistic characteristic looks. 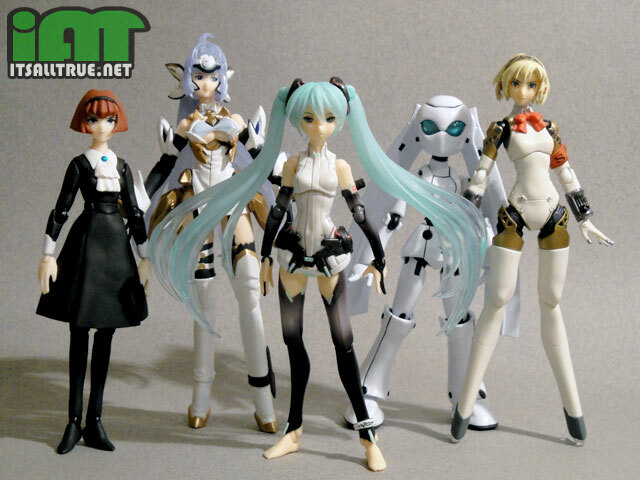 wish i had the kagamin cosplay fig they made. Don’t know why they chose to give her a tail, but it is still electronically influenced. Her tail is really just a black cord with a USB-like port at the end of it. It also connects into her belt, which has that whole speaker motif. It’s an odd design choice, but I still think it looks pretty good. Neat. I have one of these on itsway to me cause the design is so cool. No idea who this is so thanks for the info. Nice review and I’ll echo Dayraven again and ask for a ruler or comparison pics of these kind of things next to a ML or a DCUC for size relation.